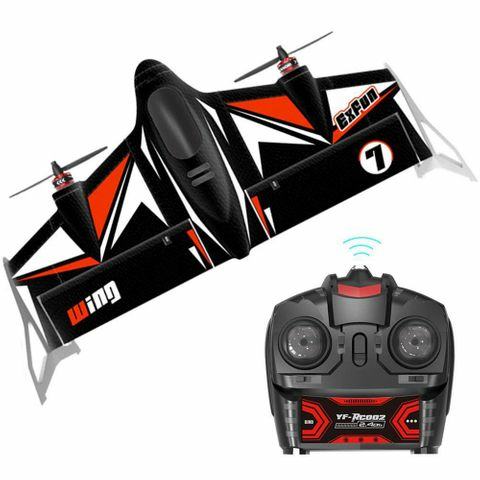 ARRIS 500mm wingspan fixed wing aircraft is a multi-function racing drone, and it's easy to control for different level rc hobby lovers. It comes with a RTF version, and you can fly it directly, bringing you a wonderful flight experience. � Light weight & Aerodynamics design - The airplane is not only light weight, but also based on aerodynamic design, greatly reducing the air resistance to the aircraft, making the flight faster, more stable. � Support three flight modes - Vertical flight, level auto-stabilization flight, horizontal manual flight. With different flight modes, the flight performance is more agile, the more flying fun you get. � Easy to fly and control - Supports hand throwing flying function, vertical take-off and landing. Support flight mode one key transition switch, and intelligent fixed height. It�s a good gift for kids or different level rc hobby lovers. � Strong power system - High quality 1806 2300kv brushless motor with 5030 two-leaf self-locking paddle, the flight speed up to 100km/h.